• What are the proposed probate fee increases? • What is Probate, and what are the first steps I should take when a loved one has died? • What are my responsibilities if I am the Executor or Personal Representative of the deceased’s estate? • Do you always need to obtain a Grant of Probate? • How to administer a loved one’s estate correctly and accurately. • How to prepare Estate Accounts and account to beneficiaries when the time comes to distribute the estate. 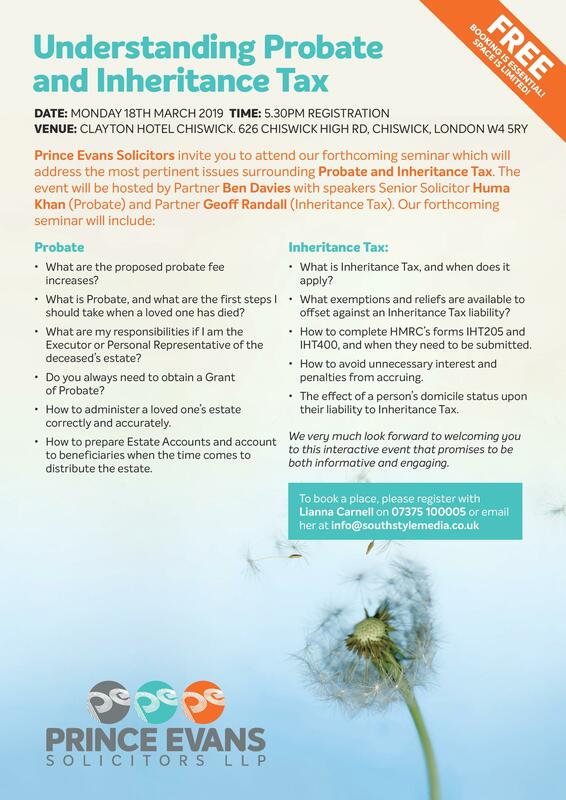 • What is Inheritance Tax, and when does it apply? • What exemptions and reliefs are available to offset against an Inheritance Tax liability? • How to complete HMRC’s forms IHT205 and IHT400, and when they need to be submitted. • How to avoid unnecessary interest and penalties from accruing. • The effect of a person’s domicile status upon their liability to Inheritance Tax. We very much look forward to welcoming you to this interactive event that promises to be both informative and engaging.